As I predicted in my Barn Diva post, here I am, waxing poetic about caprese salad. It truly epitomizes late summer to me. I could (and sometimes do) eat caprese all summer long. Perfectly ripe heirloom tomatoes, buffalo fresh mozzarella, basil from the garden and a fruity organic olive oil, just sing together. It’s such a great light vegetarian dish and is wonderful for sharing with friends. My husband, Marc, found an awesome, very thorough article from the San Francisco Chronicle on the ins and outs of everything caprese. There are quite a few rules for the purest caprese lovers and I’m happy to adhere to some, and throw others out the window. First, it almost goes without saying, but it’s so important I’m saying it…The quality of ingredients is everything! It’s always important to have high standards about the quality of food you use, but in a dish like caprese, you only have four or five ingredients. So, if you use mealy tomatoes, or cheap olive oil, you compromise the whole dish. There are a number of ways to present the ingredients, so feel free to play with it depending on the size and shape of your cheese and tomatoes. With so many wonderful varieties of produce available these days, you don’t have to stick to red tomatoes and green basil. I like to prepare caprese with striped green zebra tomatoes and purple basil. 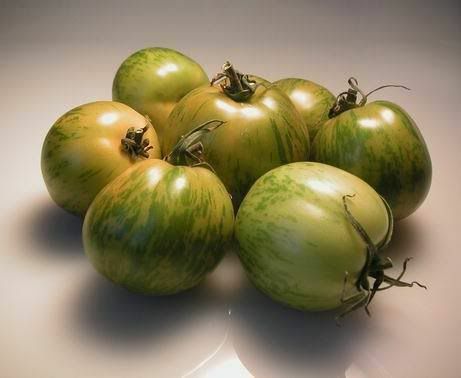 Trust me, even with this bright green color, these puppies are ripe and juicy. Here in California, the farmers markets are full of red carrots, orange, green and purple tomatoes, yellow cucumbers, purple potatoes and pink beets, so it’s great fun to incorporate them into traditional dishes. Now, apparently it’s traditional for Italians from Capri to make caprese salad with slightly under ripe tomatoes and NO vinegar. The California way (and my preference) is to use ripe juicy heirloom tomatoes. This is totally unsanctioned by purests in either Capri or California, but I love to drizzle my caprese with a sweet, tangy fig balsamic vinegar. The fruity tang is a wonderful compliment to the sweetness of the tomatoes, without overpowering the subtlety of the mozzarella. 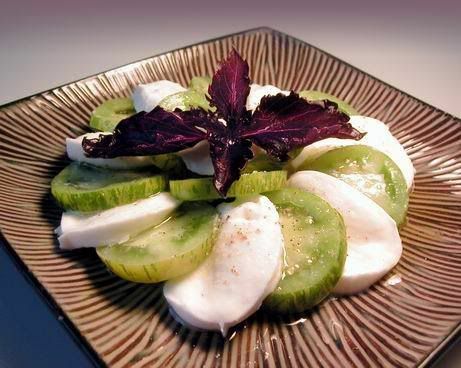 I make caprese with cow’s milk mozzarella often, but it really is best with the super creamy rich water buffalo’s milk. Mozzarella di bufala is incredibly perishable. Fresh mozzarella from cows is already something you should use within a few days, but mozzarella di bufala needs to be eaten the same day, or the next. It won’t just be a little off, it will be completely sour and awful if it sticks around in your fridge. But truthfully, it’s not that different than if you were buying a good cut of meat or something. We just aren’t accustomed to spending six bucks on four ounces of cheese. So, there isn’t much of a specific recipe per se, but here are some suggestions. Just bring the mozzarella to room temperature. Slice it and a few delicious tomatoes. Layer in a circle on the plate, or stack, alternating with cheese and tomatoes. Top with whole or torn basil leaves. Then sprinkle salt and pepper and drizzle with your best fruity olive oil. I also like to drizzle it with fig balsamic vinegar from my favorite Italian deli in Santa Monica (Bay Cities), but you do what you think is right, where the vinegar is concerned…I promise I won’t tell. It is a great dish served with a good crusty, chewy artisan bread. Rustic olive bread is my fave. The salad looks gorgeous. I love caprese and happily eat it all summer long too. I like adding minced shallots to mine. Or making a caprese sandwich. Mmm. Beautiful presentation! Those tomatoes look scrumptious. Hooray for the shout out to bay cities! I love how you presented the salad, Bri – caprese salad is one of my all time favorites! Wandering Chopsticks – I love your name by the way. I saw on your blog what it means and is a great food blog name. Mmmm…caprese sandwich…yum! Thanks! Andreea – Thank you! Yay for caprese! Glad you liked the back round info. EJ – Thanks! Yay for Bay Cities. I’ll have to link to their web site. Best sandwiches in California! Patricia – Thanks! It’s so fun to play with presentation and color. Caprese is really a near perfect dish, in my opinion at least. Wow, Bri, I must say I love your blog, the photos, and the writing. A new fav of mine! Bri, that looks amazing! I coincidentally bought a whole bunch of oddly-coloured tomatoes a couple of days ago – now I know what to do with them. Thanks! Garrett – Aww shucks, you are too kind. Thanks for your compliments. I really do want to try out the fresh fig ice cream recipe you have up. Syrie – Great! Don’t you love it when you buy something, and then someone gives you an idea of something fun to do with it? Thanks. yummm — can I come over to your house to eat — your husband is SPOILED!!! Thanks Dave! Let us know when you are in the Bay Area and we’ll have you over for dinner. I suppose Marc is spoiled, but he spoils me too. Ah, out here on the east coast, we always make our caprese salad with a drizzle of balsamic. Perfect with homegrown tomatoes and basil. Goslyn – Yes, for me, it’s all about the sweet ripe homegrown tomato and balsamic. Gotta have the fresh basil too, or it’s just not right. We still have the last of our local summer tomatoes, so maybe I should have a little December good bye to summer with a little caprese this week. Yum!